Meditation is a tool for discovering ourselves—our gifts, weaknesses, hopes, and fears—and opening to the essence of who we are and how we fit into the world. 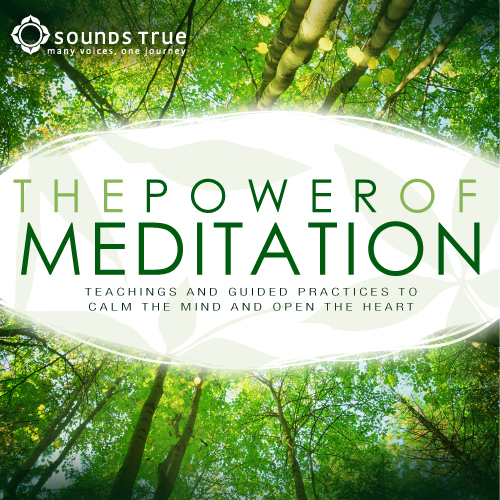 For the past 25 years, Sounds True has had the privilege of recording many of today's leading meditation teachers from diverse spiritual traditions. The Power of Meditation: Teachings and Guided Practices to Calm the Mind and Open the Heart invites you to experience for yourself the countless benefits of regular meditation practice. Tami Simon describes how meditation helps accelerate genuine transformation and how the practice can empower us to meet today's unique challenges with fresh solutions and a renewed sense of possibility. The author of Touching Enlightenment discusses the many motives behind meditation describing how it has always been a part of human societies and why meditation offers a vital gift to us today. Meditation is a tool for embracing everything that arises in our experience—especially that which we ordinarily prefer to avoid. Jack Kornfield explores how meditation enables us to face the reality of impermanence and learn to relax with uncertainty. Although there are dozens of styles of meditation, one thing many practices have in common is the ability to synchronize body and mind in the present moment. Thich Nhat Hanh guides us in the art of mindful breathing, a cornerstone meditation skill that unfolds the richness of this moment. The author of The Kindness Handbook leads us in a formal sitting session where we use the breath to calm the mind and draw attention away from busy thoughts. Meditation is celebrated for its ability to cultivate tender-heartedness and activate compassion. Pema Chödrön guides us in the centuries-old Tibetan Buddhist practice of "tonglen" (literally "taking and sending") for dissolving the boundaries we sense between ourselves and others. For this meditation, you're welcome to simply lie down and let go, as Mindfulness-Based Stress Reduction founder Jon Kabat-Zinn takes you on a guided visualization into the heart of relaxation. You will receive exclusive email discounts, find out about our latest releases, and get the inside scoop on Sounds True. You’ll also get Weekly Wisdom, an inspiring selection of FREE audio, video, and articles. We never share your email address, and you can unsubscribe at any time.